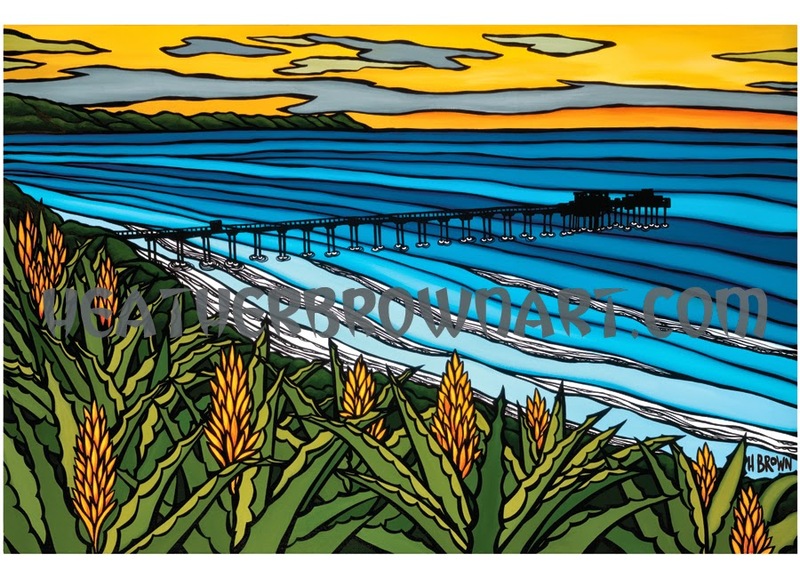 The original "La Jolla Sunset" will be auctioned off at the event and they are taking proxy bids as well, so if you are interested in getting a new published original and supporting a great cause, check them out! I will also be having a show with Susan Wickstrand Roche at Bliss 101 in Encinitas, CA on Friday August 15, 2014 with new originals, new limited edition canvas giclees, books and more! Surf art from Hawaii by North Shore Artist Heather Brown. This piece was made specifically for the 2014 UCSD Moore's Cancer Research Scripps Pier Longboard Luau and Longboard Invitational being held on August 17, 2014. Give to a great cause when you bid on this auction piece of surf art by Heather Brown.